On our last trip to New York City, we stayed in the most wonderful NoMad Hotel just north of Madison Square Park, and on the edge of Koreatown. We planned to have an outing to Koreatown to try out one of the better Korean Fried Chicken places, but had a major wrench thrown into our plans when most of the neighborhood found itself without power, or with power that was constantly flickering out. However, one place I called, Mui, said that aside from deep-fried items they could still prepare food, so we headed off to check them out. Mui is nestled into a cozy building on W 32nd Street, located upstairs from the Miss Korea BBQ (which itself is an interesting site, since their restaurant is spread over the first several floors). Normally, one would take the elevator, but since the power was out, the elevator was as well, so we got to see one of Koreatown’s less-savory stairwells (like many places in NYC, the stairwell seems to serve a secondary purpose as extra storage). But arriving at Mui, we found ourselves in a slightly trendy-looking Korean club. 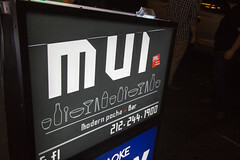 Mui sells itself as a “Pocha Bar”. 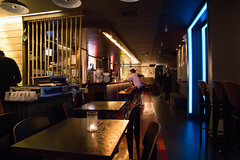 Pocha translates roughly as street food, and a Pocha Bar is basically a place serving the equivalent to Korean pub food: sake, mixed drinks, beer, and a variety of soups, noodle dishes, and other bar food. 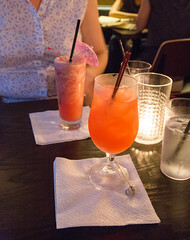 Indeed, we quickly settled on a pair of cocktails (lychee for me, rum and acai for Carol), and then looked over the soup menu. I always enjoy a good ramen, so Carol and I decided to split our order with one order each of kimchi ramen (one of my favorite combinations of Japanese and Korean traditions) and miso ramen. 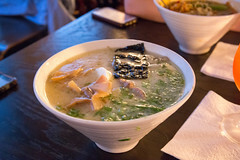 Well, when the waitstaff told us that the power fluctuating in and out (with more “out” than in, most of our lighting being provided by candles and LED lights), they could still serve us Ramen quickly… they weren’t kidding. It took only about five minutes for our soups to arrive. I’ll start with the miso ramen: this was a nicely done ramen: a good broth rich in both pork and miso notes, the noodles nicely cooked but still a bit firm, and a good selection of vegetables. Overall, a good ramen, and the only thing less than perfect was the egg (I prefer my eggs in my ramen barely cooked). The kimchi ramen? Also a good hit: a nice, rich, and very spicy broth combined with a bit of pork, this was a nice, bold combination of flavors. 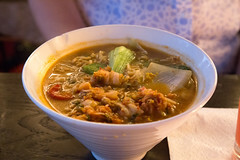 Overall, we went into Mui expecting a provisional meal with all of the power issues, but, pleasantly, they were to serve up a very pleasant dinner of nice cocktails and ramen soup. I’ll have to come back again and try them sometime when there aren’t issues beyond their control.